Are you prepared to handle the dog days of summer while lowering your electric bills in regards to your air conditioning? Metal roofing in Howard Beach will do the job. Metal is a type of roofing that reflects heat which helps to lower energy bills. There’s lots of ways in which a metal roof will benefit you. For one; your home will not get too hot therefore lowering your energy bills. We often use too much energy trying to cool our home’s down during the summer. With a roof that deflects heat from getting in, there will be no need to use a lot of excess energy. Metal roofs come in an array of styles. They come in all different colors as well as textures. Unlike conventional roofs, metal roofs come with options. A metal roof, that is well-maintained, will last anywhere from 40-60 years. Your metal roof serves as an insulator on your home. Lighter color metal roofs deflect the sun’s rays which help to cut down on energy costs. This makes it an energy efficient device and well worth the investment cost. 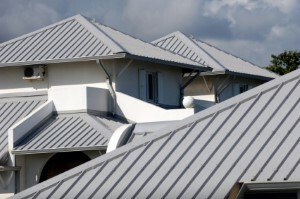 The materials that go into the construction of a metal roof are made from recyclable aluminum. Once a metal roof is replaced, the materials can be used to make another one. There is a lot that a metal roof can do for you. Someone that has liability insurance is not a bad choice when hiring a roofer. You don’t want someone climbing up your roof without any insurance. That’s a liability waiting to happen. You want to keep yourself as well as the roof work protected from anything happening. A reputable roofing company won’t ask for money up front. An agreement is always drawn up to bind the two together. Once a contract is signed, the work needs to be completed in a timely manner. A contract is a lawful document that states there is an agreement between the homeowner and the roofer. If you’re seeking a metal roof, you should think about how hot your home gets in the summer and how cold it does in the winter. Lighter colors help to deflect heat whereas dark colors draw heat in. You can always call in the Howard Beach metal roof contractor from Eden Queens Roofing Contractors after you have decided. If you are looking for Howard Beach Metal Roofing then please call 718-819-7700 or complete our online request form.